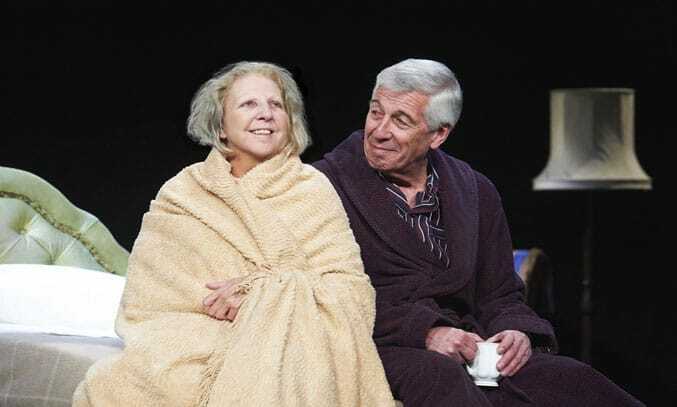 Ending its UK tour at Salford’s The Lowry, WAITING FOR GOD brings comedy and poignancy to an audience that lives knowing that old age is the path ahead. But how you tackle it is up to you. Your only as old as you feel and if that’s still 23, then a joy ride to Bournemouth in your Niece’s Porsche is just what the doctor orders. Originally seen on our TV screens for five series in the 1990s, you might think it would be difficult to recreate WAITING FOR GOD in the theatre for the modern age but original writer and creator Michael Aitkens has bought the characters and the comedy from screen to stage easily, all be it with a 27 year gap. Updated with the technology of today brings new relatable comedy to the performance. The silver surfer is in the retirement village and ready to cause trouble for the conniving manager. Ten years younger than her septuagenarian counterpart Diana Trent, Nichola McAuliffe is convincing in the leading role as the battle-axe extraordinaire scheming with new resident Tom Ballard to give the parsimonious Baywater Retirement Village manager Harvey Baines the run around. After stepping into the role last minute Jeffrey Holland (Hi-de-Hi) still gives a polished performance. He joined the cast in April when Roy Hudd, who was originally cast as Tom Ballad, was forced to pull out from the production due to ill health. Harvey Baines played by Samuel Collings is devious, smarmy and just what you expect of a business manager, whilst Jane Edwards the retirement village assistant played by Emily Pithon is naive to the modern world and blind to how he treats her and the residents. Sarah Chase, Diana’s niece portrayed by Joanna Bendings brings the poignancy of life out of her Aunt and makes her realise that the circle of life carries on, whether your there to help it along or not. The set is well thought out and the change of props helps you through the story setting the scene in a way that perhaps harks back to its TV origins. In the 1990s old people were seen to be behind the times growing old gracefully and quietly, the TV show seemed outrageous, but today, in the age of smartphones, reality TV and rock stars being 74 still touring and fathering children, it doesn’t seem to shock any longer. The production ends in a hurry, rushing to reach an odd conclusion as if life too is rushing to reach its conclusion. WAITING FOR GOD runs at The Lowry until 8 July 2017.